Fra Fee has gone from an aspiring young actor living in a small town in Northern Ireland to appearing in the Academy Award nominated blockbuster, Les Misérables. Before he was snapped up by Oscar winning Tom Hooper to appear in the movie version, Fra starred in Les Misérables on the West End stage. We managed to catch up with Fra despite his increasingly busy schedule and he told us all about his journey to life in the limelight. Check out what Fra has to say about his transition from stage to film as well his antics on the Les Misérables film set. 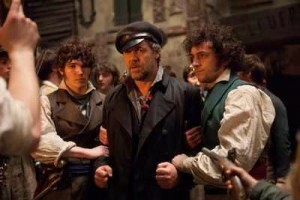 Fra goes on to discuss the “Barricade Boys”, building the Les Miserables set, Russel Crowe and onscreen bloopers! 1 – Fra Fee His name might seem unusual, but it’s actually short for Francis, although he assures us that it’s only his mum that actually calls him that. 2 – Fra’s Family Fra comes from an acting family! Fra says his dad is a “tremendous actor” and his three older sisters also have a penchant for the dramatic arts. Fra’s dad often took the Fees to the Lyric Theatre in Belfast to see shows, which inspired Fra’s love of the stage. 3 – Fra Fans Fra has had an surge in fans following his work with Les Misérables. He is looking to name the fans (in similar style to Gaga’s “Little Monsters”) and suggested the “Fee Friends” as a possibility. He will accept answers on a postcard! Yes Fra can act, sing and dance, but is he prepared for the CheapTheatreTickets “lightning round” of miscellaneous quick fire question? Check out our video below to see if the poor fella survives! To book tickets to the Les Misérables London stage show, click here!